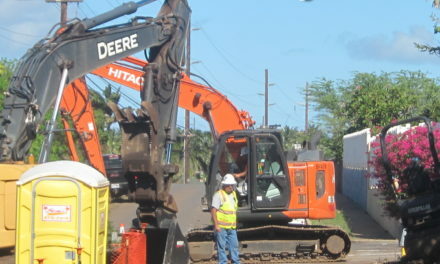 KCA appreciates the Maui News seeking our input on this controversial county government project. The Kulanihakoi bridge replacement project that drew opposition from the Kihei Community Association and South Maui residents earlier this year has been delayed, maybe even for a few years. The county had planned to go out to bid in early summer for the nearly $4.7 million project. The work included replacing the four Kulanihakoi culverts with six along with a concrete bridge structure. 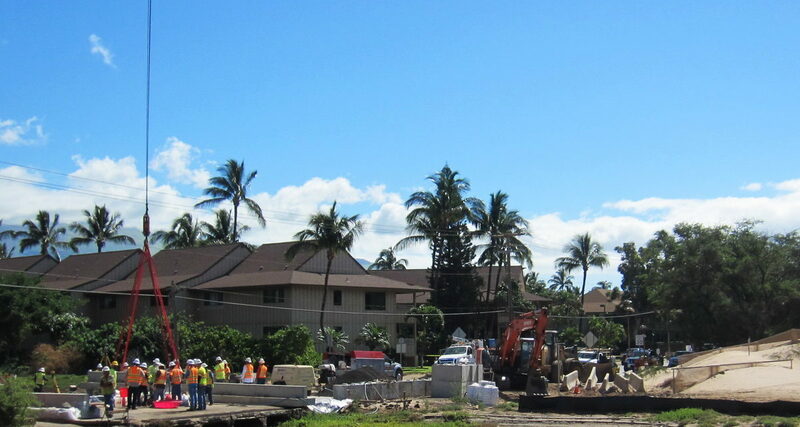 The project would help mitigate flooding on South Kihei Road near the old Maui Lu Resort. Plans also called for a temporary detour mauka of the bridge. But new flood zone requirements derailed plans for the temporary detour, said Public Works Director David Goode this week. And, since the county is performing additional analysis on the overall drainage for the watershed, Goode said the county wanted to see what the analysis suggested. He said it could impact the design of the culvert-bridge. But funding for the bridge has lapsed, Goode said. That included $3.4 million from the federal government and $1.25 million from the county. Project funding will need to be reappropriated when the county is ready for construction, he added. “So given all that, the project is not ‘dead.’ It is being re-evaluated in light of the more detailed drainage way study and the change in flood zone requirements,” Goode said. 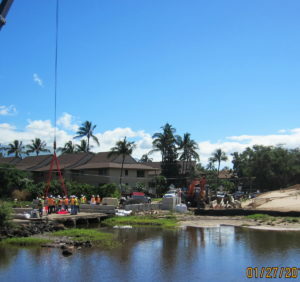 The Kihei Community Association doubted the project as planned would stop chronic flooding, and its members preferred a prefabricated bridge as a way to handle a greater volume of stream flow and to reduce debris buildup during storms. Vernon Kalanikau, the poo, or head of the Native Hawaiian Aha Moku O Kula Makai Council, objected to the temporary bypass because it would have run over a freshwater spring where offerings are made. 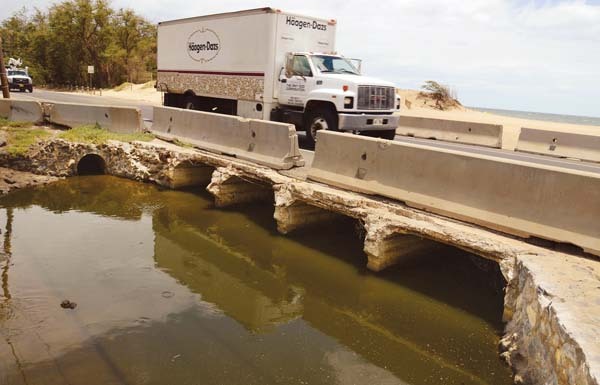 In April, Council Member Elle Cochran drafted and led the passage of a resolution to urge the Public Works Department to discontinue the Kulanihakoi Bridge replacement project. Instead, she urged the department to present an alternative plan with a prefabricated bridge. The resolution has no force and effect of law, so it amounted to a request. Moran said he’s worried about what will happen in the meantime while the county waits for the completion of studies. He pointed to the end of the Mayor Alan Arakawa administration this year and then a slate of possibly new department directors coming in January, which would impact ongoing projects. If there were a bad storm, Moran said he’s anxious about whether the current deteriorated culverts would be able to handle the floodwaters. Kalanikau said he is pleased that the freshwater spring will be left alone for now, since the temporary bypass plan has been scrapped, and was glad the community was getting involved. He remains concerned about not only flooding but the effects of other developments mauka of the area. As critics raised objections to the bridge plans earlier this year, Goode said that alternative plans for the bridge were explored in the project’s environmental assessment and the department had engaged in dialogue with the community organizations, including the community association. He said a prefabricated bridge on piers, as suggested, would not work because such a bridge would need a road expansion. And, that would not be possible because of the limited space with condominiums in the area. In addition, the proposed design, which was examined in the environmental assessment, would not be feasible because the bridge “cannot go up really fast and down really fast,” Goode had said of the community association proposal. Goode added that council members appropriated money for the project in fiscal 2011. But, in a letter last year, Goode told the community association that the current bridge proposal would not prevent flooding. Like many Hawaii watersheds, the drainage way at Kulanihakoi flattens and fans out close to the shoreline and floods adjacent properties before reaching the culverts.